Hallo! Restaurants is the first company in Bali, offering home delivery for clients, expatriates and tourists living in hotels or in their own bungalows and villas. The experience of recent years in this period makes us Number One Bali delivery services. However, Hello! The restaurants are dedicated to providing our restaurants associated with a fast, efficient and easy to use home delivery services of food produced by them. Hallo Restaurants is a food-Bible, which contains all the restaurants selected menu.several countries with their specialties, from China to Thailand, French, Italian,Indonesia Japan Mexican, Greek … .. And much more! 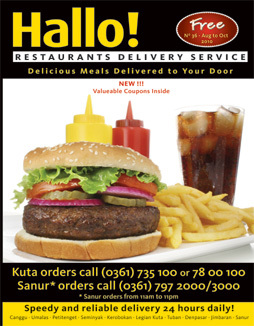 For your food directly by calling Restaurants Hallo! Kuta area and 200 797 797 3000 for Sanur are, our friendly customer service specialists will help you. Shipping charges are choosing a pointsonly. 5000 will be applicable for any additional selection that point.